After six movies, countless books, and an almost infinite variety of associated products, the Star Wars franchise is rivaled only by the Catholic Church in terms of sheer hagiography — and you can only imagine where we’d stand if the church didn’t have a 2,000-year head start. As a culture, we love Star Wars in the way we love our parents and professional football: It’s something built into us from a very young age, and removing it would be to strip out a little piece of our identity. All of this was in full display on Thursday, when director Jason Reitman and Film Independent held a special edition of their Live Read series, which in the past has featured many, if not most, of your favorite movies. The series is usually put on at the Los Angeles County Museum of Art, but this edition was moved to the newly renovated Theatre at Ace Hotel downtown, and ticket prices were bumped up accordingly — my comped ticket, in the far back of the orchestra, was worth $75. What screenplay would someone pay $50, or $75, or even $100 to hear performed? I already gave you a hint. The consensus around The Empire Strikes Back as the best Star Wars movie is so bulletproof it doesn’t seem worth discussing. And the folks who came out to see it read were not the type to argue that point. They were the type to wear Millennium Falcon T-shirts and recite the phrase “intergalactic proton tentacle [something] [something] advertising droids” in like, casual conversation — I heard this said out loud, I swear to you. As the director of both Up in the Air and Men, Women & Children, Jason Reitman knows better than most how the whims of the public can change, but that makes him even more qualified to understand the appeal of this reading series. It’s critic-proof: The people who come know what to expect, and the only surprises are positive. At the Ace, Reitman flexed his muscles a bit. In order of how they sat on the stage: Stephen Merchant played C-3PO, Dennis Haysbert played Lando Calrissian, Ellen Page played Han Solo, Jessica Alba played Princess Leia, Aaron Paul played Luke Skywalker, J.K. Simmons played Darth Vader, Kevin Pollak played Yoda, Rainn Wilson played Chewbacca, and Mark Hamill (Mark Hamill!) played Emperor Palpatine and Obi-Wan Kenobi. It’s interesting to see actors performing from chairs, with music stands in front of them. Even handicapping for their juicy roles, Merchant and Pollak were outstanding; Pollak’s Yoda voice could be dubbed onto the film with no ill results, and Merchant used C-3PO’s prissiness as a sort of riff. Hamill was clearly having an amazing time, and his knowledge of the material was unbeatable. Simmons was great, but it’s interesting to see how such a masterfully physical actor can be limited by immobility. Page as Han Solo was an applause-worthy curveball, and she seemed to have a blast. And the rest of the cast did about as well as you’d expect strong actors to do at reading lines for the first time: They were good enough. As a literary form, the screenplay is halfway between a novel and Ikea instructions. They can be beautiful and compelling on their own, but they’re also weird, for the obvious reasons: A screenplay is meant to inform a movie. It might be among the best pieces of literature ever written — and many screenplays are up there — but without the movie, it’s still dominated by the sense of suggestion. Empire is credited to Leigh Brackett, cowriter and writer, respectively, of the film adaptations of The Big Sleep and The Long Goodbye, and to Lawrence Kasdan, and it’s generally believed that George Lucas had a pretty heavy hand it in, as well. 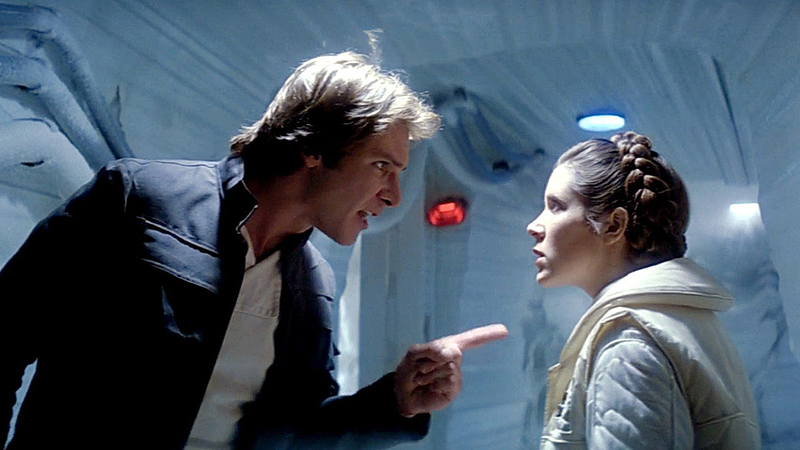 Listening to the script being read, we could all guess where Lucas had made his mark; the point at which Han “kisses [Leia] now with slow, hot lips” seemed a prime candidate, and Reitman actually invoked the name of Lucas while Page raised her hands in celebration of what her character had just done. Later, a hallway is described as “Art Deco.” The script shimmered with imagination and ambition on the one hand, and on the other highlighted just how remarkable the visual imagination of the film is: It has to be, to balance all that camp. The Empire Strikes Back is a movie. It’s also a collection of cultural touchstones, iconic characters, and inside jokes. When a piece of art becomes such a known and essential element of the culture, it gets stripped down for parts, and you could see the audience light up like a buzzer when the cast hit those legendary beats. Even if, like me, you aren’t more than a casual participant in the cult of Star Wars, it’s fascinating to see this worship carried out in person. We love a lot of different things.